La Sainte-Chapelle (The Holy Chapel) is the only surviving building of the Capetian royal palace on the Île de la Cité in the heart of Paris, France. 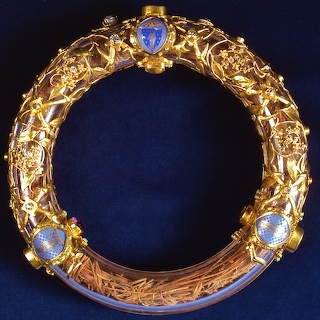 It was commissioned by King Louis IX of France to house his collection of Passion Relics, including the Crown of Thorns - one of the most important relics in medieval Christendom. Begun some time after 1239 and consecrated on the 26th of April 1248, the Sainte-Chapelle is considered among the highest achievements of the Rayonnant period of Gothic architecture. Although damaged during the French revolution and heavily restored in the 19th century, it retains one of the most extensive in-situ collections of 13th century stained glass anywhere in the world. Most of Louis' precious relics were lost or destroyed in the French Revolution; the few that remain are in the treasury of Notre-Dame Cathedral. King Louis IX of France built the Sainte Chapelle to treasure the priceless relics of Christ; his thorn crowns, the Edessa Image and 31 other relics. Forming part of the buildings of the Palais de Justice (once the royal palace) on the Île-de-la-Cité, it was built by Pierre de Montreuil (1243–46) for Louis IX (St. Louis) to enshrine the Crown of Thorns and other sacred relics brought back from the Crusades. It was admirably restored in the 19th cent. by J. B. Lassus and Viollet-le-Duc. 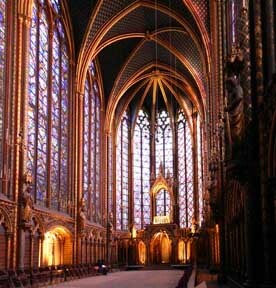 Now a museum, the Sainte-Chapelle is one of the finest examples of medieval art. It consists of two chapels, one above the other, and a spire. A winding staircase leads from the painted and gilded lower chapel to the porch of the upper chapel. The elegant proportions and airiness of the upper chapel, its 15 magnificent stained-glass windows, separated only by thin colonnettes and reaching nearly from floor to ceiling, and its vividly painted columns and panels combine to create the effect of a sheer blaze of color and light. The Sainte-Chapelle is a superb example of the Rayonnant style in Gothic architecture. In 1806, the Crown of Thorns was transfered to Notre Dame. It can be seen every first Friday of the month at Notre Dame. "Three of Christendom's Sacred Artifacts are stored in the basement of the Notre Dame Cathedral, a piece of wood from Jesus's cross ("the true cross"), one of the nails that affixed Jesus to the cross, and THE CROWN OF THORNS THAT THE ROMAN SOLDIERS PLACED UPON HIS HEAD. These artifacts have been recognized by the Vatican as 3 (of 12) artifacts that can be traced directly to Jesus Christ."